Erebus is a Haunted Attraction located in Pontiac, MI. Team Scary Potter and the Hauntwarts Express reviewed this attraction on October 15, 2016. 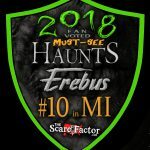 It’s been scaring up support for over three decades, but Pontiac, Michigan’s best haunted attraction, Erebus, is showing no signs of slowing down. Praised for it’s unique props, set design, and over-the-top thrills, Erebus has truly established itself as one of the must-visit haunted attractions in the country. 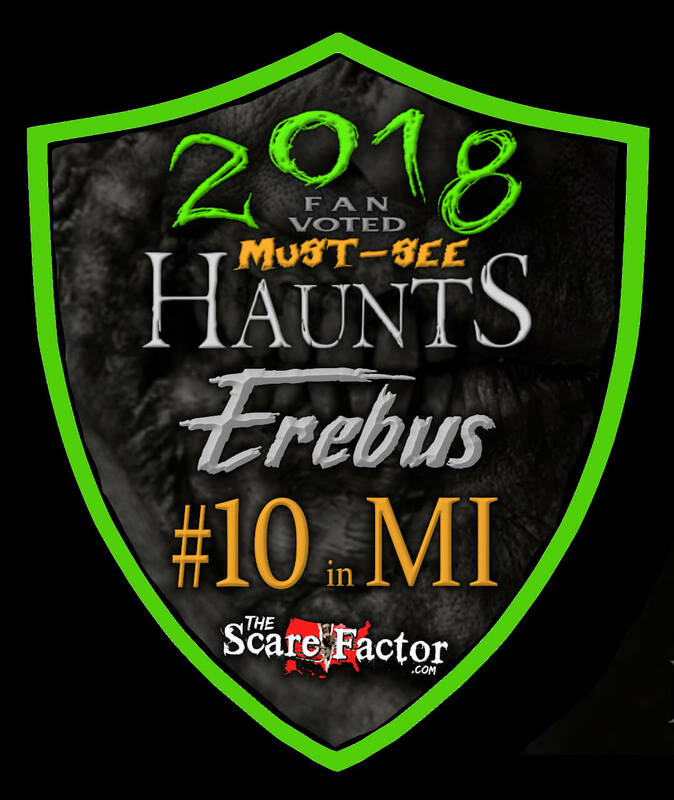 This Halloween season, any hauntoisseur seeking out the biggest and the best that this industry has to offer, mark Pontiac onto your map and make your way out to Erebus immediately. On a given night, Erebus fills its twisted halls with at least 100 evil caretakers – a word that I use for a very specific reason. Especially in the early sections of the attraction, it’s true: there are a good deal of startle-actors and a few interactive actors. These devilish denizens portrayed their particular characterizations well, though we didn’t spend much time with most of them. The doll room dame, and a few zombies were particularly noteworthy. BUT, the actors are not the star of the show here; they’re not intended to be. They serve their purpose, yes, distracting and startling, but they mainly exist to enhance the omnipresent malevolence of the attraction itself (see Fright Effect and Special Effects). In this, they are quite effective – as hors d’oeuvres to the environmental chaos and monstrous interlopers. Overall, though, the vast majority of the cast was properly adorned – believable and visually creepy. If you can follow a spotlight (or several of them, actually), you can find Erebus. If you are somehow able to miss the gigantic, eerie building at their projection point, perhaps consider a stronger visual correction prescription. Unfortunately, given its location, Erebus does not have access to its own parking. There is a lot directly across the street that can be accessed by patrons, though, for a fairly-substantial $5. There are several ballpark-style vendors of light-up gadgetry perusing the queue line, peddling their luminescent wares. We have actually purchased several pairs of light-up gloves here, as they are fairly inexpensive and really cool. After completing a walkthrough of the attraction, there is a souvenir shop and a food booth. You can also have your picture taken and purchase a collectible Erebus photograph. The staff that we encountered were friendly and helpful, particularly haunt owner, Ed, who was kind enough to give us some of his time to provide details and background for the attraction. A swell gentleman, that one. One important note: we all hate haunt-choking: inevitably, within minutes of entering an attraction, because each group is moving at a completely different pace, one set of patrons will run into another. Yes, we all hate it – it can cheapen the experience when the group in front of you is getting the scares, but the actors don’t have enough time to reset for your group. Fortunately, there are multiple “checkpoints” throughout Erebus, at which monster-staff hold up progression and reestablish proper gaps between groups. This is a MUCH appreciated design decision. City haunts can be a tough creature to properly cultivate, as urban sprawl is not the most conducive environment for haunted attractions. Indeed, the initial line for Erebus feels like the entrance to some exclusive club with a bouncer poised at-the-ready to admit or eject potential party-goers. Even the loud music emanating from the attraction-proper seems to authenticate this interpretation. Fortunately, circumstances alter dramatically when you enter the Erebus building. The queue line has been wonderfully transformed into a futuristic tableau, like the inside of an enormous, high-tech space shuttle. It is easy to quickly forget that you are in downtown Pontiac and not aboard an intergalactic space station. This new addition to the waiting line is a much-appreciated atmospheric boost. By the time we reached the ticket-taker, the effect had overtaken us. The set design of Erebus’s waiting line is better than the “guts” of some actual attractions. Erebus’ bread and butter, without a doubt, are their effects. They create the attraction’s physical environments and they provide the majority of the scares, so Erebus’ potency is, then, completely dependent on realistic and well-constructed special effects. Verdict? Mission accomplished. Most notable about the design structure of most of Erebus is that most of the pieces you see in use – either as eye candy or functional mechanization, are homemade and relatively simplistic. Erebus feels like the dream haunted attraction of every 12 year old, aspiring haunt-gineer… stringing pieces of fishing line in his parents’ basement to creep out his brother. Much of their effects are unmistakably low-tech at heart, but so clever and unique as to be MORE effective than their convention-bought cousins. Don’t get me wrong, Erebus’s special effects are professional-level and visually-striking, but they are fabricated through more natural techniques than you’d normally see at a haunt of this magnitude. It gives the set designers a lot more control over how particular effects interact with their environments and customers. The result is a 30-minute thrill ride, during which you, the protagonist, is beset by every type of environmental calamity imaginable. (see Fright Effect below) The degree of success that Erebus is able to achieve would likely be impossible with by-the-numbers, factory-made, animatronic contraptions. The ambient sound effects used in the attraction work to enhance the persistent dread introduced by the interactive set design and the lighting subtly nudges your frayed nerves over the edge. The single greatest environmental design is certainly the swamp. This effect blends together the details illustrated above perfectly: a simplistic design broadcast through the lens of clever craftsmanship into a truly effective result. Erebus has a very thin theme involving a scientist sending patrons through time. It can be a bit difficult to catch if you reach the introductory room late into the video clip. Sporadically throughout the attraction, you enter a teleporter of sorts and can see a large clock-device that indicates you have shifted through time again. Honestly, the theme is largely vague, but does serve as a basic justification for the different realms you experience. We didn’t see anything stray too far beyond the limits of this concept. Erebus’s actors were pretty good; often preferring to “hidden in plain sight” as fictitious elements of the scenery, they administered a solid number of animated startles. A few “boo”-scares were weak, either due to uninspired performances or poor actor placement, but most actor-based interactions were effective. The majority of frights, by far, though, came from environmental scares or human-directed faux-animatronics. Of the latter, there was an incredible variety available – all manner of beast, realistic or fantastical, pursued us throughout our ill-fated jaunt through history. From all directions they came – pawing, growling, leaping toward us. We found ourselves gleefully trapped in over-sized mandibles on multiple occasions. Most memorable of all, though, were the environmental barrages. Of any haunt we have visited, no other has had the quantity, originality, or effectiveness of Erebus. While individual details would spoil the fun for any potential Erebusers, allow me to paint a few broad strokes. Everything is your enemy; everything. Walls will assault you, windows assail you; even the ceiling above is an unexpected violator. Trust NOTHING. One certain stand-out is their vortex tunnel. Yes, if you have tiptoed around the haunted block, vortices are not an unfamiliar challenge. However, the designers at Erebus have spiced their iteration up with an added element of balance-distortion that will completely disintegrate your equilibrium. Perhaps the most unique scare-attempt of recent memory, though, challenges claustrophobics in a truly sadistic fashion. Erebus is worth a visit to experience this “ballsy” effect alone. It took us approximately 30 minutes to fully experience Erebus; ticket pricing is varied and depends on the date of your visit. A general admission ticket ranges from 23 to 28 dollars, though a VIP pass will always cost $50. There is also a free t-shirt giveaway to the first 200 people in line (and paying full price) each night or for the first hour. Erebus is a unique experience. We visit a lot of haunted house and are incredibly excited if we see one or two new effects or concepts at an attraction. At Erebus, perhaps 70% of the effects are completely unique to their haunt. I’d say that absolutely tickled us pink; but, given the season, let’s stick with orange and black. There are a few attractions out there that really do earn the moniker “nothing else like it.” Erebus is one of these and they definitely deserve all the praise and accolades they’ve received over the years. For anyone who loves haunted attractions, Erebus must, without question, be on your haunted bucket list – a creative, original attraction to which we give our highest recommendation. For the 25 we paid per person I’d have to say it was not worth it. Last year they were scarier. It …show more seemed the people were just not as into it or into making themselves scary. The zombie chainsaws at the end were the exception. I was seriously bummed. I was looking forward to a good scare and that didn’t really happen. I hope they amp it up in the future or I will be leaving this haunt out.